Details and specifications of Davka's Mellel Hebrew Writer, £59.00 (GBP inc VAT RRP £69.00). Mellel Hebrew Writer is Davka’s version of the world's first Hebrew word processor for Mac OS X! 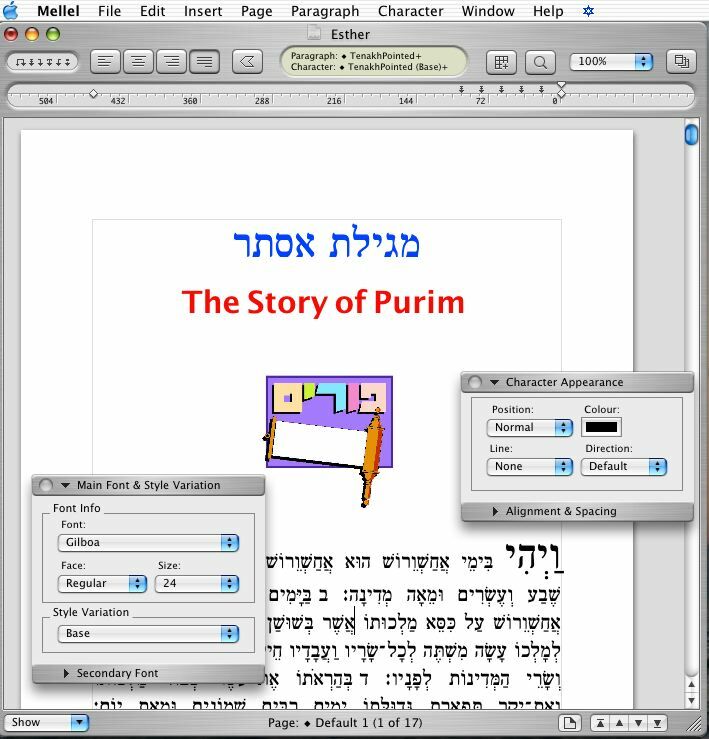 Native Hebrew word processing for the Apple MAC OS X. [Buy now] or call us on 0870 766 3699. Mellel Hebrew Writer is Davka’s version of the world's first Hebrew word processor for Mac OS X! This program features full Hebrew/English writing capabilities, accessible through an elegant and efficient user interface. Mellel Hebrew Writer presents a fresh approach to Hebrew word processing that will help you type and edit Hebrew/English documents more efficiently, creatively, and successfully. Export and import to .doc (requires OS X version 10.3 and higher) Note: this option does not support footnotes and endnotes or tables. Import Font Matching, a special panel that appears when you import .doc or RTF files and lets you match the fonts in the imported file with the fonts in your system. Compact view option, which displays only the contents of the page with a minimal margin around the page and between pages.